Unlike anyplace else in Texas, or the world, the Piney Woods is a meeting point of disparate ecosystems and wildlife. The result is a profusion of natural riches that stimulates the senses. The state’s national forests and nature preserve command awe, respect, and protection. 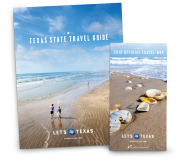 Walk a straight line through the Piney Woods region of East Texas, and you’ll cross forests, prairies, marshes, lakes, and rivers. The sheer biodiversity is astounding, and with 675,000 acres of land up for public enjoyment, it’s open to discovery. We trekked into the green-washed wilderness of four national forests and one preserve for an unforgettable foray. Each forest, ranging in acreage from 153,000 to 163,000, sprawls over a varied landscape. After an era of lumbering, the region was reforested in the early half of the 20th century, its pine and hardwood trees allowed to tower once more under guidance. Today expansive lakes, fed by rivers and streams, break up the green with soothing shades of blue and brown. That macrocosmic beauty sets the framework for tiny revelations on any given trip. Hike a trail in the Angelina or Sam Houston national forest in the winter, and you might see a bald eagle soar overhead. Find moments of sublime stillness in Davy Crockett National Forest’s Big Slough Wilderness Area, or fish for striped bass in the Sabine National Forest. No matter where you turn, nature surprises you with an out-of-time magic. The otherworldliness enveloped us in Sam Houston National Forest, where we spent much of our time. About an hour’s drive north of Houston, the forest is a one-stop destination for almost every outdoorsy exploit, from hiking to camping to picnicking, boating, fishing, and hunting. We reserved a camping spot in Cagle Recreation Area on the northern shore of Lake Conroe, a popular man-made lake. As we cruised its otherwise placid 21,000 acres, our rental boat sometimes rocked with waves created by nearby jet-skiers. Packed marinas, shoreside restaurants, and golf courses multiply in the southern half of the lake, but we quickly shied away from civilization and stayed north for the gorgeous green shoreline views. 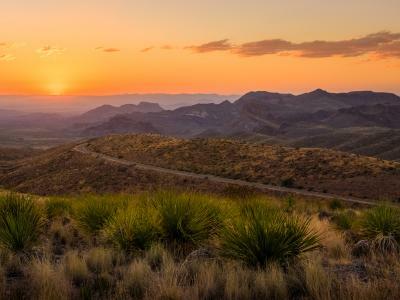 The forest also boasts the famous Lone Star Hiking Trail, which stretches a whopping 128 miles. Its meandering path is a navigational saga divided into three sections over a diverse survey of forest, making it exceptional for backpackers and day-trippers alike. We fell into the latter category, and so we dabbled along on a 10-mile path near the Stubblefield campground. Guided by trail markers through the easy terrain, we enjoyed the shade of the encroaching brush, falling into spells of quiet reverie that went interrupted only by sparse road crossings. At day’s end, we returned to our car feeling spent and happy—that odd mix of depletion and renewal that only a great hike can offer. The area in southeast Texas known as Big Thicket National Preserve has plenty of trees but isn’t a designated national forest. What makes it different? In a word: biodiversity. Its 112,250 acres are home to thousands of species of plants, just as many species of animals, and a few plants that eat animals. A hike through some of the preserve’s 15 units, or protected nature areas, reveals why it’s nicknamed “the Ark.” But migratory birds, mountain lions, and American alligators here propagate in numbers greater than two by two. Starting out at the visitors center eight miles north of Kountz, Texas, we walked about two miles to the Kirby Trail, an easy path that makes two loops through eye-popping scenery. 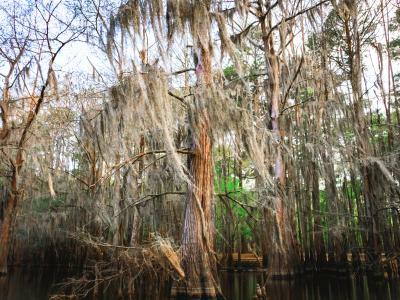 One of 10 ecosystems in the Big Thicket, the cypress sloughs—with their spindly trees inspiring reverence—were a personal favorite. From there we headed north to the Sundew Trail, where we paced over a boardwalk through a bog containing two carnivorous plant species, pitcher plants and sundews. We even caught glimpses of a plumbeous vireo and two hooded warblers, uncommon birds for the season. Then again, the Big Thicket is all about uncommon. Conservation efforts have resulted in comebacks, some clear and some qualified, of many animal species in the Piney Woods. The red-cockaded woodpecker was designated an endangered species in 1970, and after slight improvement, it is currently “near threatened.” Bird-watchers vie to glimpse the bird in the region’s forests and nature preserve.